Well folks, the time has come. Within a week, I will have gone through my undergraduate commencement. I will officially have a degree in music. I have already finished all of my classes and finals, so I wanted to write about my college experience. If you will be majoring in music or you just want to learn more about it, I hope I can shed some light on the reality of being a musician. It’s tough, and it will be even tougher in the future, but it is so worth it. A couple of weeks ago, I talked about my musical background. 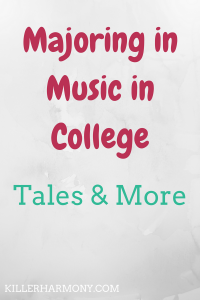 I had a different musical upbringing, but I managed to thrive throughout my college music career. Here are the details of my college education. I started college at a community college, and I began in the college concert band and music theory and ear training. I really enjoyed playing in band for the first time and studying music at an advanced level. Flute lessons were also a part of my schedule. Sadly, I had to study flute with the saxophone professor, because my school didn’t have a flutist on staff. While I was able to improve and make up for the time I lost by not playing flute earlier, I could have progressed even more if I had a proper instructor. I also got to take my first, and only, semester of music composition. It was an interesting class, and it got me more interested in composing as part of my career. I had a bit of a setback this year, because my college did not offer the second year theory courses. I would have to transfer or wait to take those classes. At the time, I took this as a sign that I shouldn’t study music. We all know how that went now. I finished the requirements for an associates degree in liberal arts halfway through my second year. So, I tried my luck and auditioned for a local conservatory. My lack of experience and lack of a proper flute teacher were enough for me to be denied. I had a moment to cry, but I remembered a state school not too far from home. I then decided to see about studying music there. That February, I auditioned and received a music talent scholarship. I accepted the offer. That spring, I attended a local university so that I could take a few more advanced classes. It was then that I was able to get experience teaching music and flute to kids. I decided that I really wanted to be a music/flute teacher. I was finally on my own. It was my first time not living at home. I had a single room on campus, and I was able to study music at a bigger program than before. I struggled with the decision to major in performance instead of music education. Teaching interested me, but I didn’t want to direct ensembles. I was also able to finally take the second year theory and ear training courses as well as music history. It was also my first ever marching band season. Neither my high school nor community college had a football team, and therefore no marching band. Marching was certainly an experience that I don’t regret having, but it was difficult. My junior year also brought with it my first time performing a solo for flute. I had worked on solos before but never for the purpose of performing them. I was also able to get rid of any stage fright that I had. I still can’t believe how fast this year came and went. I had a lot of cool stuff happen this year. I gave not one, but two, solo recitals. They were both a lot of work, but I enjoyed every minute of it. There was a bit of drama during the middle of the year, but I think that I was able to overcome the craziness. Spring break was just what I needed. I also got a bit of a break from music in the form of a minor in Spanish. I’m so glad I added it to my degree. This year, I only had one real music “class” aside from lessons and ensembles. That was my basic conducting class. It was not basic at all, but it was a senior level course. While I don’t plan on conducting much in the future, I am glad that I can if necessary. This year was probably my favorite year of college, because I became really close to friends in my dorm as well as other music majors. I know that I will miss it, even though I might not always admit it. My music degree prepared me for more than just music performance. I learned a lot about music and the concepts behind pieces. I learned how to teach flute to others, and I came into my own as a musician. Lately, I have been contacting places back home for music related jobs. I hope to start a career as a flutist, teacher, composer and writer. Music is my passion and my biggest skill. I hope to use that passion and skill to inspire the next generation of musicians. Do you have any specific questions about majoring in music? Let me know in the comments and I will cover them in a future post! Previous Previous post: Too Old to Learn Flute?